This article was written on 10 Jan 2019, and is filled under Current Exhibitions. This exhibit involves a competitive process to select outstanding examples of student work in a variety of media. About $1000 in awards will be given to the top student artists and designers including special recognition in the area of ceramics, metals, drawing, book arts and printmaking. Our Juror this year is UW-Milwaukee Professor Glenn Williams. entries for the Juried Student Show will be due the Monday and Tuesday after Spring Break, April 1 and 2. Glenn Williams is the Area Head of both Digital Studio Practice and Sculpture at UWM. He will be selecting work on Wednesday, April 3. The reception for the exhibit will be on Tuesday, April 9 with awards being announced at 6 pm. Students will present works for review by Department of Art and Design faculty to determine their eligibility to enter the BFA program and to assess the progress and graduation status of Junior BFA track students. Students graduating from the Department of Art and Design present their creative work in this group show. 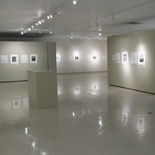 The exhibit typically feature works in all fine arts media including painting, drawing, printmaking, book arts, sculpture, metals, ceramics and computer assisted design.